This farmhouse dining table extends to over 25 feet is you add additional extensions. It offers plenty of space for the whole family to sit and gather today at the end of the day as they break break. This Amish farmhouse table is made for each customer so you can choose the wood, finish, leg and edge style to create the look you want. You can choose to go with the standard size of 42" wide by 60" long or upgrade to one of our larger sizes for more space. You then can add anywhere from 3 to 20 twelve inch extensions. Be sure to read some of our happy Customer Testimonials as well as our Trade and Business Profiles. If you have questions, would like to receive wood finish samples or are ready to place an order then just call one of our friendly sales associates at 1-866-272-6773 or stop by our brick and mortar Amish furniture store in Sarasota, Florida. We would love to hear from you or meet you face to face. 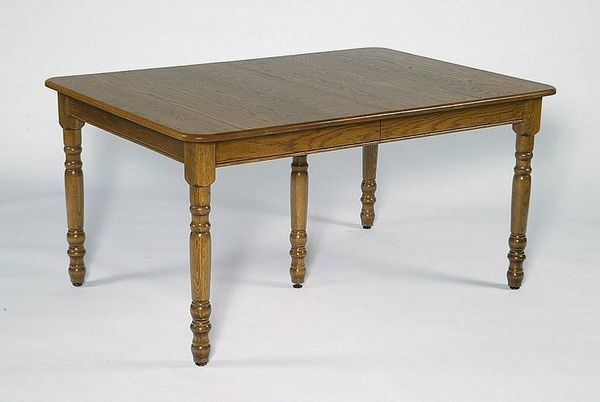 Floor to Bottom of Skirt: About 25"
Table Leg Width: 2 3/4"
Optional Height: 36" or 42"